Persistence Market Research presents an inclusive report on the combined heat and power system for data center market in a new publication titled “U.S. Combined Heat and Power (CHP) System Market for Data Center 2016-2024.” The principal objective of the report is to present insights on the many advancements that have already been made in the combined heat and power system for data center market. This report highlights market dynamics that are predicted to influence the current market and the future status of combined heat and power system for the data center market between 2016 and 2024. The report commences with the market overview which explains the market and provides market definitions about the U.S. combined heat and power system for data center market. The section that follows discusses market dynamics including market drivers, restraints, opportunities, trends and key regulations. Through extensive research, Persistence Market Research analysts provide useful insights to market players to plan their differentiating strategies capable of evolving with the changing market landscape. The report also indicates the segment wise definition of the market along with its overall scenario during the assessment period. The publication focuses on identifying opportunities in the U.S. combined heat and power system for data center market and present updates and insights pertaining to the various segments of the U.S combined heat and power system for data center market. A top-down approach has been used to assess market numbers for each product category, while bottom-up approach has been used to counter validate the market estimations. Apart from this, the product wise weighted average selling price has been considered to deduce market values. The analysts have also studied the historical trends, statistical analysis, and government support analysis pertaining to the U.S combined heat and power system for data center market. The major countries GDP has also been taken into consideration while forecasting the U.S combined heat and power system for data center market. Few other factors covered during the detailed study of this report are the market performance in terms of sales revenue, followed by Persistence Market Research’s analysis of key trends, drivers, and restraints. The report also includes market opportunities, pricing forecast, supply routes, and the list of raw material manufacturers and logistic providers catering to the U.S combined heat and power system for data center market. This report begins with a Y-o-Y growth analysis and anticipated growth projections of the U.S combined heat and power system for data center market. It further covers market overview which includes definition and applications of the market. We have also examined the market taxonomy in this report where we have segmented the U.S. combined heat and power system for data center market based on facility size, installation type, end use, and application. The last section of the report covers the competitive landscape that provides a dashboard view of companies that manufacture and provide services in the U.S. combined heat and power system for data center market. The report contains company profiles of some of the key players and a strategic overview of mergers and acquisitions along with their expansion plans across different regions. Persistence Market Research has adopted a systematic research approach while forecasting the U.S combined heat and power system for data center market. We begin with in-depth secondary research to ascertain the overall market size, top industry players, top products and industry associations. Data is validated by the triangulation method, wherein secondary and primary research and our analysis contribute to the final data. We have also taken inputs from various U.S. manufacturers through comprehensive primary research. We identified key opinion leaders, conducted in-depth interviews with key industry players and delivered valuable industry insights and information. Yearly change in inflation rate has not been considered while forecasting market numbers. Instead, product-wise weighted Average Selling Price (ASP) has been considered to deduce market values. Confounding factors influencing pricing have not been considered in the pricing forecast while covering the U.S. combined heat and power system for data center market. Various assumptions have been made after detailed secondary research using data and information certified by the U.S. department of energy. Market revenue has been estimated after researching the official websites of governments of various states such as Texas, California, and New York. The institutional segment in the U.S. combined heat and power system for data center market is expected to gain 10 BPS during the assessment period. This segment is expected to be valued at close to US$ 150 Mn by 2024 end and is estimated to expand at a CAGR of 3.4 % in terms of value over the forecast period. The institutional segment is expected to be the most attractive segment with respect to market share index and CAGR index. Colleges/universities, general government offices, military/national security, miscellaneous education, schools and space research and technology centers have been included in the institutional segment. Colleges/universities are estimated to account for a major revenue share in the institutional segment in the U.S combined heat and power system for data center market. In terms of market attractive analysis, the institutional segment is expected to be rated close to 5.0 on the basis of attractiveness index over the forecast period. This indicates an inclination towards high growth high value during the period 2016 – 2024. The provisions given under the Public Utility Regulatory Policies Act of 1978 (PURPA) legalized the sale of non-utility-generated electricity to the grid, which helps increase the usage of combined heat and power systems in all sectors. The use of combined heat and power systems, further advanced by provisions in the Energy Policy Act of 1992 and Clean Air Act, offer cost-effective greenhouse gas emission reduction. An increasing preference for combined heat and power systems by end users over conventional power generation systems and lower natural gas prices further fuels the U.S. combined heat and power system for data center market. Considerable economic recovery and relatively lower natural gas prices is another factor which is creating a robust development in the U.S combined heat and power system for data center market. The continuous fall in the prices of natural gas has propelled the end users in the institutional segment towards the use of combined heat and power systems as natural gas. Expanded tax incentives for combined heat and power are driving the growth of the U.S. combined heat and power system for data center market. Combined heat and power systems that are up to 50 MW in capacity and that exceed 60% energy efficiency are eligible for incentives, subject to certain limitations and reductions for large systems. This tax incentive policy is attracting various institutional organizations across the U.S to adopt combined heat and power systems. 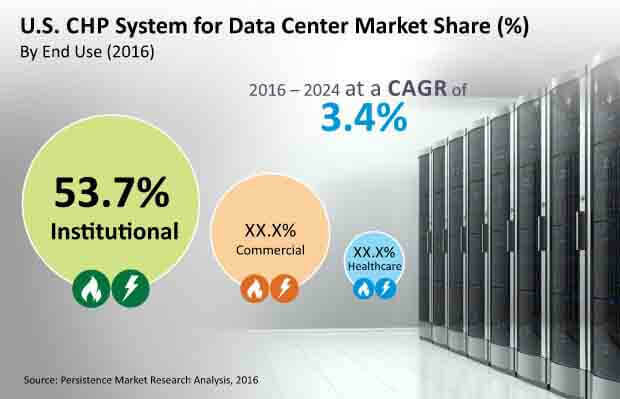 The healthcare end user segment of the U.S combined heat and power system for data center market is expected to lose market value share towards the close of the forecast period. This segment, estimated to be valued more than US$ 20 Mn by 2016 end, is anticipated to reach close to US$ 30 Mn towards the close of the forecast period. The healthcare segment is expected to exhibit the lowest CAGR of 3.3% in terms of value over the forecast period. The primary reason behind this loss in the market value of this segment is there is no scope for expansion in this particular segment of the U.S combined heat and power system for data center market. The investment in this sector has already been done by the various state governments in the U.S. and no further investments are likely to be done like in other segments such as commercial and institutional. In terms of attractiveness index, the healthcare end use segment has been rated only 1.0 during the projected period. Overall, this segment is estimated to incline towards low growth low value from 2016 to 2024.